CITAD presents policy brief on youth, peace building and entrepreneurship. The Center for Information Technology and Development (CITAD) has formally presented a policy brief entitled ‘’Beyond Winning the Minds: Youth, Peace Building and Entrepreneurship. 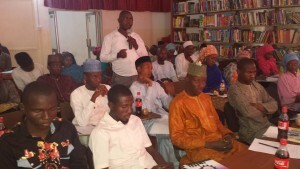 The brief presentation which took place on Wednesday 10th February 2016 at the American Corner, Murtala Muhammed Library Kano has addressed critical issues regarding youth, peace building and entrepreneurship. It recommended that the government, civil society groups and development partners, philanthropies and foundations take certain actions thereby positively engaging the youth in order to prevent their vulnerability to social vices which hamper societal progress. Youth are arguably the bedrock of any society, their optimum utilization yields effective and lasting developmental outcomes while neglecting them invites and exposes them to all kinds of problems which normally leads to underdevelopment, too much burden on the governments, unemployment, recruitment base for thuggery, robbery and insurgency. These and other numerous challenges are the reasons why the youth demand a considerable attention from especially our governments, foundations/philanthropies and civil society organizations. 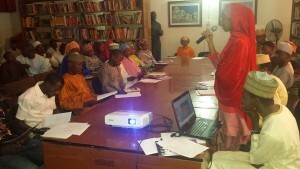 In her presentation entitled ‘’Beyond Winning The Minds: Youth, Peace Building and Entrepreneurship’’, Aisha Ahmad Is’haq of CITAD observed that the budgetary allocation to youth from 2013 to 2015 kept decreasing despite the growing number of youth in the country, this she said shows lack of commitment to the youth and therefore renders them to unwanted acts. However, the youth from their side need to understand that they don’t need to wait for the government to come to their rescue but should instead be as productive and entrepreneurial minded so that the society will be proud of them. Peace is the driving force of all progress and development, therefore the youth and everyone in the society needs to shun all acts capable of tempering the existence of peace. And the youth normally suffer greatly the consequences of conflicts, the Boko Haram insurgency has claimed thousands of lives of youth which should have been in many sectors of the economy performing various important tasks. Therefore, as youth we should be mindful of the importance of peace in our lives and the role it plays in shaping our lives as well. Entrepreneurship is also another critical area which youth need to massively venture into because there are unlimited chances and benefits, the government itself functions well with manufacturing industries, textiles, private companies, small scale businesses, agriculture which all are products of sound ideas developed by youth. And now there are many foundations, governments and individuals who are willing to offer take-up and support to youth with sound entrepreneurial ideas. Aisha Ahmad concluded with appealed to governments at various levels to provide adequate budgetary allocation to education, health, agriculture and youth-related programmes, in particular, meeting the UNESCO, WHO and Moputo Declaration Benchmark, mainstream youth participation in governance including at both executive and legislative wings and also mainstream peace building as component of youth development programmes as well as mainstream entrepreneurship in peace building programme of government. The Policy Brief presentation session was attended by United Action for Democracy (UAD), Northwest University Young Enterpreneurs Club (NUYEC), Mass Movement for Societal Development (MMSD), Mufarka Youth Association, Youth Mobilization Via Media, Center for Young Peoples Advancement and Community Development (CYPAC), Kano Youth Coalition for Advocacy and Development (KAYCAD), Youth Society for the Prevention of Infectious Diseases and Social Vices (YOSPIS), students from BUK, FUK, SRCOE, FCE Kano, ABU Zaria, Kano Poly and the media (Blueprint Newspaper, Peoples Daily Newspaper, Freedom Radio, Express Radio, Rahama Radio, Cool/Wazobia FM). ’Beyond Winning the Minds: Youth, Peace Building and Entrepreneurship is produced as part of the Peace Campaign that CITAD has implementing with support from MacArthur Foundation. 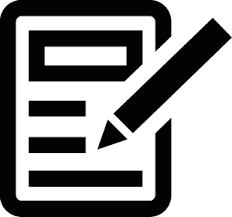 This brings the number of policy briefs produced under the project by CITAD to four. Others include one on cattle rustling, one the Plight of IDPs in the Northeast, while the fourth is on the Government Strategy for ending the insurgency. PreviousPrevious post:PRESS STATEMENT NORTHERN GOVERNORS FORUM AND IDB: THE WHOLE NORTH IS IN NEED BUT NORTHEAST IS IN CRITICAL NEEDNextNext post:CITAD hosts Journalist as February Inspiring Leadership Reflection Series Guest.